School is the valued 'home away from home' for most children. Your child's experience in the primary grades from kindergarten through third grade is critical - much in the same way that an infant's first connection with a parent is so important. If your child forms a strong bond with teachers and fellow students and responds to the curriculum in a positive way, he or she will be in a strong position to cope with the stormy years of adolescence. However, if your child develops feelings of anxiety, disappointment and inadequacy, he or she may have difficulty connecting with and enjoying school in the future. The first day of kindergarten is a momentous occasion. Even though children may be accustomed to going off to nursery school, preschool, or a daycare center, entering elementary school is still a major event. Like all transitions, the new experience of starting school can create anxiety. The adjustment can be more difficult because the elementary school may be some distance from home, and the child may attend for more hours. The child is confronted with a multitude of children, most of whom are older. He or she must deal with unfamiliar peers and teachers without the presence of a parent or a familiar caretaker. Siblings who attend the same school are seldom available for comfort. The child must make it on his or her own, truly a giant step in independence. How does a child connect to school? First, a bond or relationship must be established between child and teacher. The child must feel safe with the teacher. The teacher represents protection and caring, as well as safety and order. This underscores the need to select a school, if possible, where the teachers are kind, compassionate and nurturing. Second, the teacher also provides pleasure in the form of stimulation, new experiences and the safe environment so that the child can learn a variety of new activities. The teacher presents the ground rules and expectations, which should be clear and appropriate to the developmental ability of the child. This includes a cleanup routine, the expectation the child will raise a hand to request a turn to talk, and homework expectations. The teacher must be able to create a balance which acknowledges each child's individual needs, as well as models the values of fairness and equality. Important leadership roles should be rotated so that each child experiences a turn. In contrast, an upset or angry child may have to sit close to the teacher much of the day. A bond to school is intensified when children feel comfortable taking risks in expressing their ideas, their solutions to problems, and their creative endeavors. Children need to risk making mistakes. Commitment to school is helped when children are free to participate courageously in the learning process rather than mastering only what the curriculum demands. The bond to school and teachers is strengthened further when the individual needs of the child are addressed and the child feels that the environment is caring, safe and interesting. 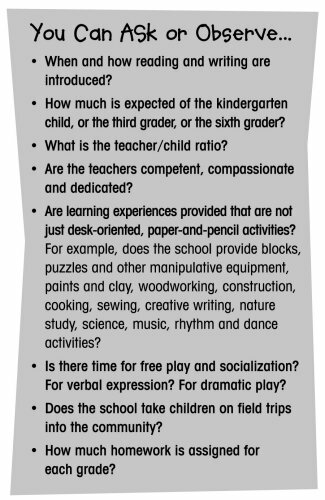 It may take considerable time and effort to find a school or a teacher that will supply all this, but it is worth the effort. Most children attend the local elementary school; however, additional school options are available for parents who are financially able and willing to pay for private education. If you have some school choices, keep in mind that what ultimately counts is what goes on with the teacher in the classroom. Visit the school if possible and watch the prospective teacher. Many schools will permit this. It is surprising how much you can learn about schools and teachers by watching and listening for 30 minutes. Remember, in the area of education, you need to be your child's advocate. Clarify what you are looking for in a school. Begin by reflecting on your own early schooldays. Do you have good memories of your school years? And do you want to find an environment that will give your child a similar experience? Should the school have the same kind of philosophy and structure as the one you attended? Or are you looking for a different approach than one you hated or found stressful when you were in school? When considering a school for your children, it is important to explore the policy concerning discipline. For example, is corporal punishment allowed? If parents have a choice, such schools should be avoided. Punishment is abusive and counter-productive. It can and often does frighten all students, even those who are not so assaulted. Despite the fact that certain schools permit corporal punishment, most educators strongly condemn these practices. Parents need to have the courage to switch teachers or schools or even opt for home schooling if the child does not feel safe in the classroom. Many five and six year olds cannot sustain extended intervals of sitting, listening, or doing paperwork. When mainly desk work is offered and valued, these children end up feeling unsuccessful and stressed. For these young school age children, it may take participation in other activities such as blocks, woodwork, clay, music, dramatic play, free outdoor play, and trips into the community to create a positive connection with school. They allow children to associate school with pleasurable experiences that help create a bond to school and help them with their later academic work. We all realize that reading, writing, math, and social studies are very important. However, some parents may feel that experiences other than academics are not what school is about, that paperwork and right and wrong answers are what count. But for many young children, the positive connection to school will not be established unless a variety of experiences are provided. It is helpful if parents can take pleasure in the child's participation in a broad spectrum of school activities. It is often assumed that a structured or formal school is required to control behavior of highly active or aggressive children, but such a formal environment can create expectations for behavior that the child cannot fulfill. It would be preferable to select a school that provides more opportunities for productive creative play and study, giving the child an environment more attuned to his or her level of physical activity and maturity. When children are asked what they like best about school, they frequently answer 'recess' or 'lunch.' These are the times when children are not evaluated or expected to be quiet. They can be themselves and not expected to sit still, listen or perform. Of course the goal of education is to inspire and to develop a sense of wonder and mastery so that most of the school day can be as much fun as recess. Isabelle Fox, Ph.D., is a psychotherapist and author of Being There: The Benefits of a Stay-at-Home Parent. Isabelle is also a member of the API Advisory Board.